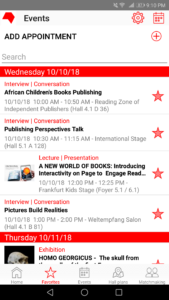 Today I’m going to share my experience with the Frankfurt Book Fair, which was October 11-14 of last month. So let me just say, off the bat, that the whole experience was way overwhelming. 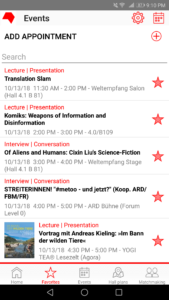 If I thought BEA was overwhelming, FBM18 (the hashtag for the fair) was even more so. The FBM is six halls. You heard me, six halls of little booths. Not to mention, all the halls have more than one floor. For example, Hall 6 and 4 had three floors. They’re roughly organized by country and for some countries, they have one booth (that is usually decorated elaborately) with a whole bunch of publishers. Whereas countries like the US and UK have individual booths for each publisher. I mean, you need to wear good walking shoes if you aren’t exhibiting, or keep nice shoes in your bag, because if you want to walk each of the halls, you’ll be walking for days. I walked each hall but I had to stretch it out where I was only doing two halls a day, from Wednesday through Friday (the non-consumer days of the festival). That being said, the fair is mostly for foreign rights and agents to sell the rights to other international publishers. Even when walking around people are in back to back meetings. It’s really intense for them. 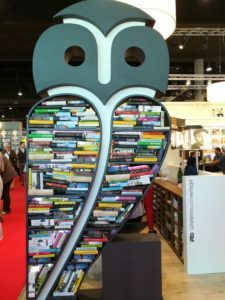 Before I even came back to Germany, I talked to someone who attends the Frankfurt Book Fair normally and she said it’s non-stop meetings and social networking events. It’s incredibly intense for them and stressful. Even my other friend who’s an editor who has to go and pitch some of their titles, said it’s a lot of meeting up with people you might only see once a year. So you might ask what did I do? 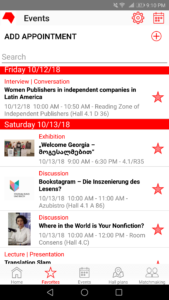 Besides walking around and taking notes of German publishers I want to research more after the festival (and after my recovery), I attended a lot of panels with publishers from other countries. 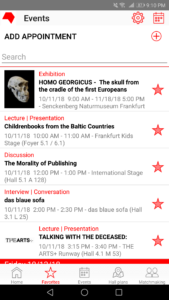 There’s a handy app for you to use to keep track of your events and booths you want to visit, which I 100% recommend you download. It’s a lifesaver. 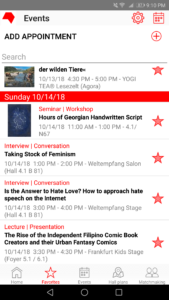 Anyway, I screenshotted the panels/events I went to and can talk about each of the days in depth that way. I won’t talk about the different booths or halls I visited because there were so many. I was keeping everyone in tune to the festival through my Instagram stories, which I forgot to save, so I only have a few photos to share with you. I would highly recommend you take advantage of all the ‘country’ specific events you can. Each year they pick a guest of honor. This year was Georgia. 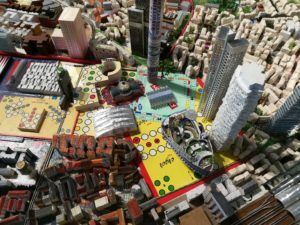 And then the whole city of Frankfurt has all these exhibits and events centering around Georgia (not to mention a cafeteria of Georgian food in the Fair). So on Tuesday, the day before I went to the actual fair, but when the opening address was, my family went to an exhibit called, Gold & Wine. It was this archaeological exhibit about Georgian tools and the invention of wine. So events like this are really worth going to. Have this picture of the beautiful weather in Frankfurt because I didn’t take nearly enough photos of the actual events. They all got sucked up by Instagram. So on Day One I started off my day learning about Children’s Book Publishing in Africa which made me think of so many things I never would have thought of. Like when books aren’t available in your language. I’ve struggled with that a little with libraries in Germany, but the scale of which they face is much larger compared to my first world problems. They also talked about the lack of children’s books in shops, dealing with the lower purchasing power, and keeping your quality up while still remaining profitable. Other challenges they talked about facing, all women run publishing houses by the way, were a lack of illustrators and for certain languages in their countries. How can they expand the children’s market when they rely on adults to buy the books? The publisher from Mauritius talked about the challenge of showing the average citizen that bookshops are for them. To get their minds wrapped about the idea that they can find something they want to read in a bookshop, and it’s an open space for them. I was walking around looking at the different ways people organized their books. It’s truly an art form. After that I just saw a few more talks about how we can keep young readers engaged with VR technology in books. Which made me think about the line between traditional reading and technology. A lot of people, when I told them I worked within publishing, where like ‘are people even reading physical books anymore?’ These panels talked about the interplay between technology. How we can enhance a book, create an environment with the technology which will engage the reader. I had never really thought about the interaction between AR or VR and books, but this show me technology that I would have loved as a child. I am a huge natural history buff. Give me all the fossils. So this day I went to the HOMO GEORGICUS exhibit. This was a rough day because I got some blisters on my foot from broken socks. The elastic broke and rubbed my foot wrong the whole day. So after the book fair day two I basically limped to the museum. Then I found out it didn’t open until the next day and I actually started crying. It wasn’t one of my proudest moment. But then after my partner scraped my sad body off the floor, we stumbled across the exhibit which was open a day early. So while I went to the exhibit the day before I put it in my calendar on the correct day. Maybe I was trying to trick myself into thinking that mini-melt down didn’t happen. But on the second day, as I was walking around by myself, I realized that company makes all the difference. Maybe you can find out if people you know are going. The people I was with during BEA made all the difference. I was happy to stay all day and had a really fun time. I didn’t NOT have a fun time, it was just about having some motivation, some reminders to eat, and people you can share the enthusiasm with. So this day was a weird sort of roller coaster. The Children’s boosk from the Baltic Countries was really interesting, but it kind of ended early because some of the panelist has to leave. But the really intense panel was…. Oh gosh, this was an intense panel because the main issue they talked about was the difference between self-censorship and sensitivity readers. I can’t even remember why it was brought up, except they talked about how in France they only care if it’s a good book, not who wrote it. And that what ends up happening is that the people or stores will self-censor while it’s not the government. While the publisher from India was talking about how important it was to highlight underrepresented voices, like those from the pariah class, because their stories were never heard or talked about. 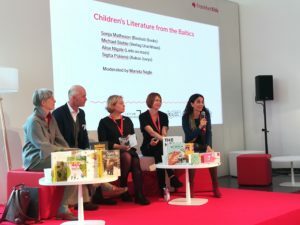 Have this photo of the Baltic Children’s Lit Panel where I discover one of my style icons. And then because of a comment from a UK publisher in the audience, the whole panel talked about sensitivity readers and ownvoices books (and also writing outside of your lane). The UK publisher said a lot of insensitive comments like sensitivity readers being “bonkers” and if it infringes on freedom of speech, and if we are becoming more intolerant (which is like what?) And I was personally confused by the reactions of the panelists about whether they supported sensitivity readers or not. At the end of the day, I’m not exactly sure where some of the panelists ended up on this topic because it was pretty obtuse, kind of walking around making a definitive clear statement. On the one hand they were talking about the importance of the voice, the authentic, but also about how we have to be challenged and infuriated. 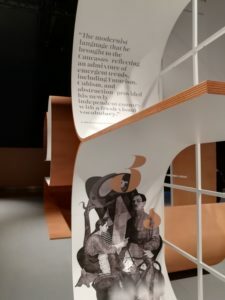 Later in the day I walked by das blaue Sofa where the author of The One-Hundred Year Old Man Who Climbed out of a Window and Disappeared which I have not read. I have only read The Girl Who Saved the King of Sweden. So the author talked about their publishing journey and motivations writing the book. After that I saw a panel about taking with the deceased and the idea that maybe we could have interactive tombstones. If we can save the memories of our departed. In order to de-taboo death. Which I am sure is the major problem as I was talking to members of my family later that evening. On day three I was pretty burnt out from walking. I know it sounds silly, but I’m not sure if you know the sheer scale of the event. For the fair, I was also getting up pretty early and staying up late. I wasn’t even taking full advantage of the opportunities of the fair. For example, I forgot my business cards at home. So this day I really just took it easy, did some easy walking, and left a little early. The only panel I attended was about Women Publishers in Independent Companies in Latin America which was, naturally, very invested in talking about the challenges upcoming in Brazil. They also talked about the representation of women and girls in the sciences, in articles, and magazines. One publisher talked about the way that stock images for the sciences are normally men. This was something I never really thought about but which, upon reflection, is entirely true. As you can see, you can see my schedule for Saturday, the first of the consumer days. The only real difference is that Hall One opens up for cosplay, so you can see A TON of people walking around in costumes. Also some of the booths become more consumer facing. So that people can buy books. Also Hall 3 which is where the German publishers were was entirely packed. On this day, my partner was able to join me, so we split up for some of these events. For example, after the day was over we went to the Guest Hall of Honor to check out the Georgian Art, which I had already seen. But funnily while I was at the Bookstagram panel in German, he found himself in the Where in the World is Your Nonfiction which I guess was mostly an editor panel? Even though we found it on the app? They gave him a fancy business club lanyard and asked him which publishing house he was from. Later in the day we saw the Translation Slam which was an interesting event, even though we stayed only for a few minutes, because I didn’t agree with some of the translations. This panel was incredibly interesting because it talked about comics as propaganda pieces. Something I hadn’t thought of in a really long time. Years ago I had an assignment in school where I had to bring in political cartoons and so I used to think more about the intersection between words and pictures as weapons, but it had been forever. So while they talked about the Komiks in the Philippines, and how they are still used today, was really fascinating. They were talking about how komiks are the literature of the masses and how important they are to popular culture. After this we went to the SF panel. Which was standing room only and the only panel I used those little headphones for. Because it was in Chinese and German and, contrary to what people believe, I do not speak Chinese. This panel was fabulous because of the POC representation even if the other panelist got very enthused about his speaking. I was sad that there wasn’t any mention of women in the panel though. They named a lot of the ‘hard sf’ greats, the male giants, but not really ANY women. I have many thoughts about this. MANY. With many scholarly articles I read for my thesis. But yes. I needed to mention it. Then even though we walked through the #Metoo movement and protests, we listened to the Wild Animal talk in the YOGI Tea Lesezelt. Which I thought was just a big room full of tea, comfy couches, and quiet, but in fact was just another reading/panel event space. But it was ridiculously warm because it was outside in the sun in this tent. 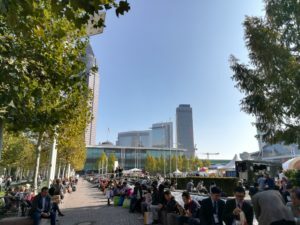 Frankly, the weather in Frankfurt was perfect for the Book Fair, for you to just eat and hang out outside. There were a few times I just sat outside in the sun listening to my audiobook to decompress. And this was the day we learned to write our name in the Georgian alphabet. Apparently they have characters that are entirely unique to their language. This was the event in which we circled the booth about five times to see if they would start the event and then had to ask. Apparently Georgians are not known for their punctuality. Which is something they said themselves, so it’s not like I’m being insensitive now. This was super fun and I have some videos but it’s also when the calligrapher, who only spoke German and Georgian, said that I write Georgian better than some Georgians. I was very proud. But in reality, there wasn’t that much to be proud of. It’s more like drawing. And when I was in high school I was obsessed with the Medieval illuminated letters. So I spent a long time looking at letters and copying them. I’m that girl. I think the best part of this day was the handwriting. What country would you like to read more children’s lit from? Frankfurt Book Fair! That’s not one you read a lot about on book blogs. That’s super cool that you were able to attend, thanks for sharing your experience.